New food budget – phew! Lemon curd – 22p a jar from the Value range: good on a pice of toast in the evening and more budget/waistline friendly than buying a dessert! Yeast extract (ie fake Marmite) – 1.89 for a jar and much cheaper than the branded one. I was sceptical but budget conscious enough to give it a go. It isn’t quite the same but it’s close enough for it to be worth the saving! Honey 99p a jar in the value range. Cucumbers – 90p each or two for £1. Total no brainer! Plus we’ve been having cucumber and carrot sticks as an evening nibble lately so a winner for us. Toothpaste – £1 each. We’d run out both upstairs and downstairs so I picked the two on offer. Branflakes – 88p for a mahoosive box. I bought some of these last month (from the Tesco Value range) and was seriously impressed. They taste just as good as anyone else’s and are a fraction of the price. I sprinkle a few sultanas on mine – much cheaper than buying the kind with the fruit added! I was really ******* off about the price increase on clothes wash. I can’t find a receipt but I’m pretty sure that Tesco’s colour clothes wash is usually £1.80. Has been for ages. I went to buy some yesterday and found that they were on offer at 2 for £4.50. WHAT?! Apparently it is now £2.49 for a single bottle. That’s a massive increase! I ended up having to buy the seriously budget version which was a much bigger bottle at £2.39. Don’t get me wrong. I’m not snobby about labels. It’s just that I’ve found using really cheap washing liquid can really fade your clothes. I only get away with wearing my clothes for years and years and years (as I realised I did when I sold some stuff on eBay) because I look after them well. I’ve tried a few budget brands before and was amazed at the difference (not in a good way). Anyway, this ‘Daisy’ brand claims to be a ‘colour’ friendly liquid so I guess I’ll find out! Back in January I decided that it would be a good idea to set myself some goals for the first ‘quarter’ rather than setting anything monthly. This has proved to be a good tactic. A month is too short and too many things can happen that are hard to change in such a short period of time. A quarter is a decent chunck of time in which to make real progress. So, how did I do? 1. Save £600 into my own ISA – done! Considering that January is one of the most expensive months of the year for us and that I had to spend over £400 on my car in the end I really don’t know how I achieved this! As in, I don’t technically earn enough money for this to have been possible with what my outgoings have been. I put some real effort into earning a bit extra last month/earlier this month and that just tipped it over and I made my target. I won’t always have the opportunity to earn a bit more so I took the chance while I could. 2. For Husband and I to save £500 into our House fund – done! We actually went over because of a tax refund. Without it we wouldn’t have made it as quite a few household expenses have come up over the last couple of months. But the good news is that we managed to pay for everything and also managed to save anyway. 3. Lose a stone – er, no. But I did manage to lose half a stone! Yay! Ok, so I put 3 pounds on and then lost 7 but still. Half a stone! I’m happy with that. Particularly considering how much cake I’ve eaten. I’m really pleased with my progress. I read an article (which annoyingly I cannot now find) that said you should make a big effort to work towards your goals during the first 12 weeks of the year. The theory is that if you get off to a good start then the rest of the year follows suit. If not, the rest of the year will be an uphill struggle. I really took this to heart and am hoping that I’m officially on a roll! So, here are my goals for the next ‘quarter’ April-June. 1. Save £750 into my ISA. This is going to be a killer. Since I’ve been back from maternity leave (nearly a year now!) I’ve struggled to save £150 a month which I then pushed to £200. I’m now trying to push that to £250 a month. I don’t know if I can really manage it. It should be possible with real slashing of personal spending and depending on what expenses crop up that I cna’t forsee (there is bound to be something over 3 months – it just depends what it is and how much it costs). So. £750. Let’s give it a go! (BTW this is a fund I have a target on. If I manage to put back the whole £750 then I’ll only have £450 to go which is a real incentive as I want to get on with putting more £ into the House fund). 3. Weight loss: lose another half stone. Yes, the other half of the stone I was hoping to lose by the end of the first ‘quarter’. Slow and steady winning the race is fine with me – as long as I actually make it to that damn finish line! I am actually massively encouraged by what I/we’ve managed to achieve in the first quarter. It has really given me a boost and some confidence about what is possible. Here’s hoping to another good report at the end of June! I’ve just finished my 3rd round of auctions on eBay. It is horribly addictive! I already posted about getting myself a dress and jacket after the first lot. After the second round I also bought a bundle of clothing for my girlie (which has yet to arrive so I have no idea what it will be like. Anything I don’t like will be re-listed straight away) and a small gift for someone. I then cleared out the remaining balance as some unexpected bills have cropped up this month (we had to have a plumber out and it cost £70). I was a bit gutted to lose my proceeds but also grateful that I had them there! No fear though…I’ve made over £30 tonight! I haven’t decided what I’m going to use it for yet so it is just going to stay put for now. Tomorrow I’ll be rummaging and photographing to get ready for round 4! The lack of food budget is beginning to get a bit tiresome now. I’m eating up all of the stuff I don’t really want or like. I bought a bag of frozen salmon fillets a while back and I’m not keen. Whenever I’ve bought fresh salmon in the past it has been lovely. This stuff is verging on tough and smells really fishy (yeah, yeah, I know salmon is a fish but you know what I mean!). Still, it’s already there and it is a good source of protein. I suppose. And then there’s the soup I made that went wrong and is really thin and horrible. I’ve still got 3 blinkin’ portions in the freezer! Still, that’s 3 lunches next week that I don’t really have to bother about. I find eating food that I’m really not enjoying quite depressing though. Still, the way I’ve got to think of it is that I’m getting rid of a load of useless stuff and making room for some nicer food while spending hardly anything. That said I think I’m going to crack and top the food fund up. I’ve got a week off next week as my parents/childminding team are away! I’m not in the holiday zone whatsoever and keep subconsciously making plans for next week that revolve around when I would be working. I’m actually going to do a bit of overtime so I can save even more next month. Anyway, when I do remember I’ve got the week off I keep thinking about all of the batch cooking that I could be doing or how I could try out one or two new recipes. And then, of course, I remember there is no room in the budget for anything extra. So I think I might move an extra £10 or so in from the slush fund. It’s not as if we’re going to be doing any eating out or anything holidayish like that! My plans for this week off are very low key but I’m really looking forward to it. Mostly I’m looking forward to spending every single day with my girlie. I’m also planning on doing some finishing touches on the house, having a go at replacing the sealant around the bath and kitchen sink, cooking some (hopefully) good food, hanging out with my other ‘Mum’ friends, going to visit my Gran, walking on the beach and generally being domestic. And it will be very cheap! Thankfully I get paid next week so I’ll have petrol in the car (the digital display says I have less than 20 miles before I run out) and maybe a few pennies in my pocket! Stretching the pennies and making a few more! The photo really doesn’t do them justice. 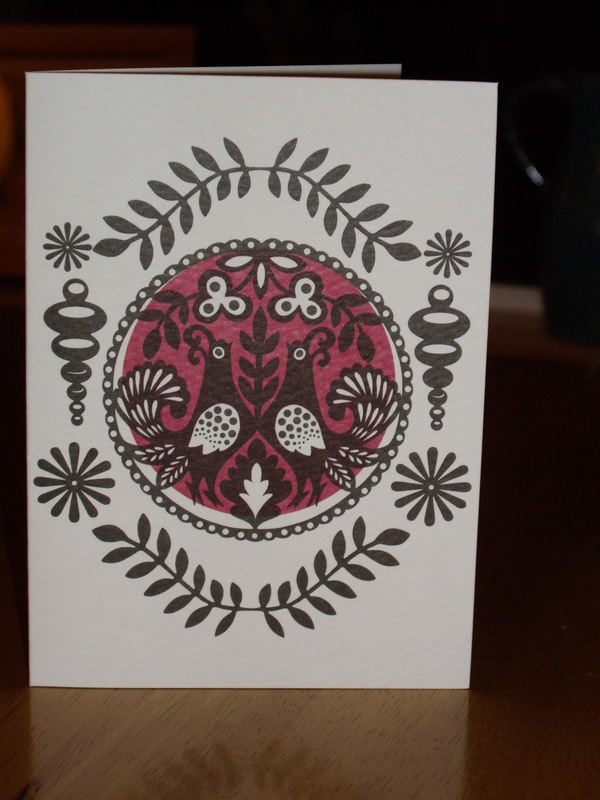 A box of 8 costs £4.75 so about 59p per card (much cheaper than buying cards individually). I think they will be perfect for birthdays or thank-you’s or whatever occasion might come up! I’ve been busy ebaying for the last week and have sold quite a few items of clothing. My ‘profits’ have now gone over £50 and I have quite a few things still listed with bids on and people watching. Good times! I’ve used some of the proceeds to get myself a couple of things also from eBay including a casual, lightweight jacket (something I don’t own) and a wrap dress (an optimistic purchase since dresses and I don’t generally mix well but I live in hope!). It is nice to see yet more space emerging as my clothes storage space is very limited. I’m in the frame of mind to get rid of yet more stuff. I have so many items of clothing that I just don’t wear so I’m going to keep at it! While I had my unplanned blogging break I also had an unplanned reading break. Last year I averaged two books a week so to have nearly two months where I only ready one book…well… I must have a total brain shut down! Anyway, my inability to get into a book ended when I finally picked up A Discovery of Witches which I got for Christmas. I’m so glad I did – it is absoloutely brilliant and so far up my street I’m surprised it didn’t come and knock on my front door. I am now anxiously awaiting the next book in the trilogy which is due to be published later this year. Husband bought me a couple of books for Valentines Day. When he told me I thought ‘uh-oh’. And yet the boy did good. One of the books he got me was the latest biography on Queen Elizabeth. I wasn’t sure if I’d like it at first even though I love books (fiction and non-fiction) about the monarchy through the ages. Anyway, I am utterly gripped. I’ve read 430 pages so far and I am having real trouble putting it down. I keep finding excuses to read ‘one more page’ which rapidly turns into 10 or 20 pages. 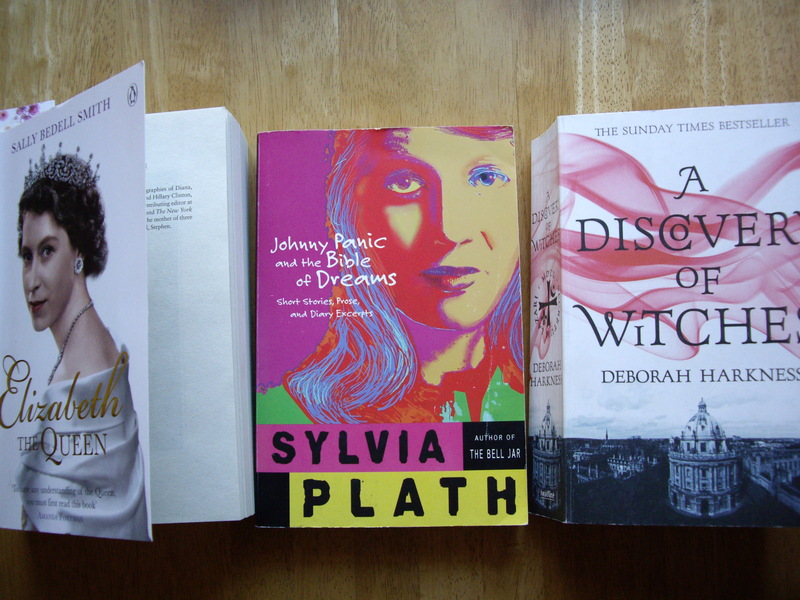 Lastly, I’ve decided to try and pick one slightly more challenging read each month and have kicked off with Sylvia Plath’s Johnny Panic and the Bible of Dreams. I’ve long been facinated by Plath and a friend in the States sent me this American edition a few years ago. It is a collection of short stories, essays and journal extracts with a riveting introduction by none other than Ted Hughes. It’s good to have my reading mojo back! What are you reading at the moment? 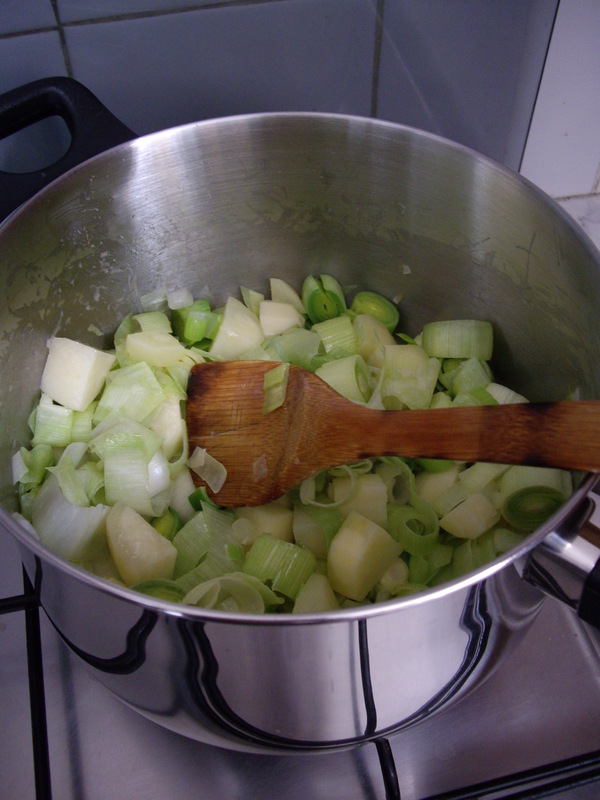 The food budget is still precarious – I’m just waiting to see how it pans out really! I was determined to keep the shop under control yesterday and was very careful about what I picked up. I wanted to get some chicken to make a stew and was amazed at the prices of chicken breasts. Tesco had an offer with three ‘trays’ of meat for £10. The trays of chicken breasts each contained two portions of meat so at £10 for 6, the cost per chicken breast would have been £1.66. The only option that was slightly cheaper was chicken from their Value range but I didn’t even consider that because the meat was from Holland. I have no idea about what standards they have in Holland but I assumed (perhaps wrongly but I had no information to hand) that since it was cheaper in spite of being imported that they have lower standards for welfare. I was adamant that I wanted British chicken. Fortuntely I managed to find some in the reduced section. Even better, each portion was ready wrapped to pop in the freezer. The ‘offer’ (I don’t know how much I buy into the original price!) was £7.99 down from £9.99 but I got it reduced to £5.99 because it needed to be used the next day. 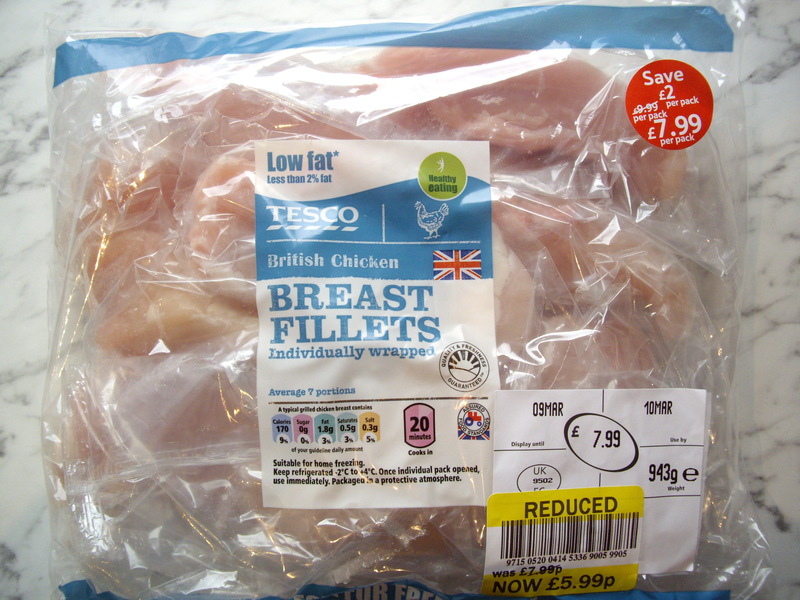 As there were 8 chicken breasts in the pack, each portion was just 74p – less than half the price of the others! I made a stew with four of the breasts and the other four are in the freezer. If it hasn’t been for the reduced section I might not have bothered with buying any meat at all. Most of the meat I’ve bought recently has been reduced due to the date. Tonight we’re having organic beef steaks that I defrosted today and bought a couple of weeks ago. The pork medallions mentioned on a previous post were frozen and eaten later that week. I swear they taste better because I know I got a bargain! I’ve finally got around to doing it – I’ve sold some things on eBay! I listed five items of clothing last week and every one of them has sold (the cheapest went for 99p plus P&P, the top seller went for £16!). I haven’t had all of my payments in yet, I haven’t paid the eBay fees and the first items won’t be posted until tomorrow. I always keep padded envelopes when I receive them and so I’ve got a good enough stash not to have to waste money on packaging, I’ll just have to pay for the postage. I reckon that after expenses I will have ended up clearing just under £30 for stuff that has been sitting in drawers for aeons. Yippee! I have already listed a few more items and need to do a spot of photographing tomorrow for a few other things I’ve had put to one side. It will be good to gain some space having made extra cash while I’m at it! I’m going to keep the money in my eBay account and use it for buying summer clothes. I’ve also spied something on eBay that could make a great present so it could be used for that too. I’m excited! Thanks to the lovely folk who left get well messages on my last post! I think I’m over the worst of it, though it is the nasiest cold/chest thing I’ve had in a long time. Unfortunately, the wee one seems to have come down with it now and Husband has been up for the last few nights with raging toothache following a botched crown so it been a really fun few days! It can’t all last forever though, right? 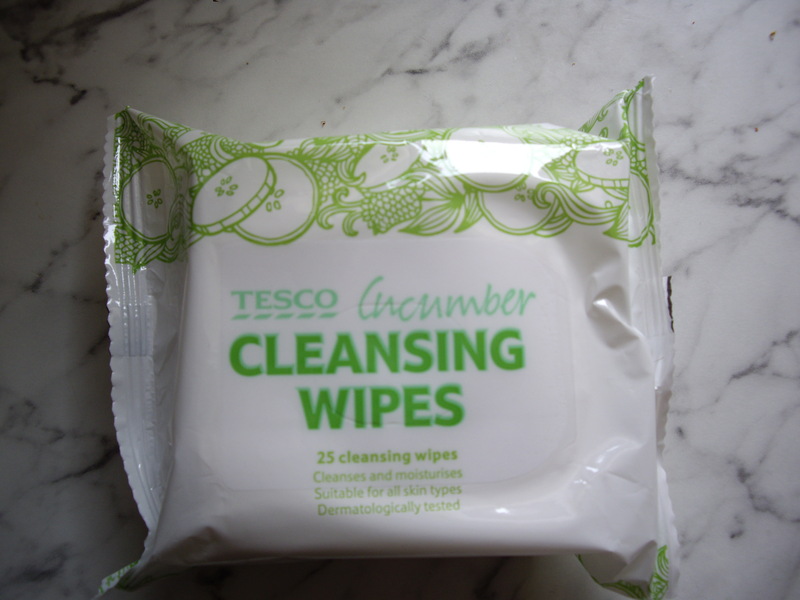 On a lighter note, I picked up these wipes in Tesco last week after noticing that mine were running low. I haven’t tried one yet but I’m hoping they are great as they were on special offer at just 46p! If they turn out to suit my skin I might try to stock up a bit while they are discounted. From the same range I also bought a cucumber facial wash/scrub which was only 80p for a generous sized tube (to go in my wash bag). I’ll report back when the results are in!